There is customization found in almost every backyard design you’ll see. Whether it’s personalized hardscape, a deck or even a pergola, standard is no longer the norm. For this reason, ShadeFX retractable canopies and roofs are extremely versatile. Our customization not only gives consumers the flexibility to choose options to suit their needs but also allows ingenuity to deliver products that can fit most spaces. While ShadeFX’s ultimate goal is to provide shelter, our solutions also offer a unique way to enhance any residential or commercial space. While relaxing in their hot tub, these homeowners were constantly worried about the threat of rain. They moved the hot tub to underneath the landing of their stairs in the backyard. Unfortunately, because of the wooden planks on the landing, even though they were out of the sun, the rain was still seeping through the planks. The solution? The homeowners attached a retractable canopy to the underside of the stairs landing making sure that problem would not occur again. 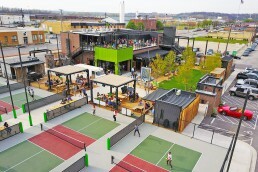 Unlike most restaurant designs, The Keg at Sherway Gardens boasts a rooftop patio with a 600 square foot opening. It could be covered or open based upon weather and comfort level of guests. To cover the unique area, ShadeFX installed two motorized canopies. Both canopies were tilted to drain rainwater beyond the patio, ensuring all seats in the space remain dry. Keeping the staff and guests in mind, a wall switch was installed so that the canopies can be opened and closed with ease when necessary. Living in an upscale urban retreat overflowing with LA charm, these Encino homeowners designed a four-post structure to house their outdoor kitchen and dining area. The main feature of this space is the rectangular skylight in the roof. It provides much-needed light into the space. This unique opening needed an equally unique solution. From dawn to dusk, the homeowners had to contend with the harsh rays of the sun. Working with Greydiantscape Architecture Inc., ShadeFX customized an 8’x12’ motorized retractable roof. 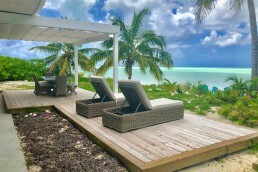 Now, at the press of a button, the homeowners can take cover from damaging UV rays or the occasional afternoon shower. When The Ritz Carlton Hotel in Toronto needed a classy set of retractable canopies, they looked no further than ShadeFX. The project requirements were very demanding as it was the finishing touch on its new DEQ patio bar. The product needed to match the finish of the existing structure, accommodate hanging lights and heaters in strategic locations, and to look like the final installation was part of the original structure. This project stands out because the patio bar already had overhead coverage made out of glass. However, during the warmer months when the sun was beating down, the glass held the heat in making guests and the space very hot. ShadeFX installed a number of rope-operated retractable shades. Located below the glass ceiling, the canopies ensure the patio is at the desired temperature. ShadeFX gives a new meaning to retractable pool covers in this installation by Wizard Industries in Vancouver, British Columbia. Spanning a whopping thirty feet long by sixteen feet wide, this canopy was ShadeFX’s first installation over a swimming pool. 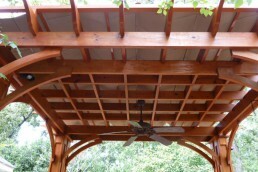 To get the canopy installed on the existing pergola, the track was mounted to stand-offs (blocks) that were made to fit into the beautiful design. The stand-offs allowed for extra tilt to the wings, so they would channel rain to the back even in heavy downpours, which are common in Vancouver. 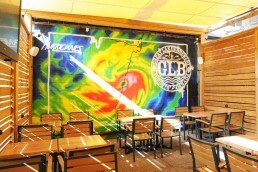 Green Flash Brewing Co. in Virginia Beach, Virginia made the list with its roundhouse type pergola that radiates outward. Working with ShadeFX, the Timmons Group was able to incorporate a one-of-a-kind retractable canopy system for the large curved structure. Nine motorized canopies were installed over the patio crafting an outdoor experience that reflected the Green Flash Co. brand and product. From curving outward, we go to curving upward with this HGTV ‘Decked Out’ project. The homeowners were looking for a versatile space that would allow them to entertain and dine with family and friends. Paul LaFrance Design and his team installed curved cedar pergola beams on a deck in the backyard, making it the focal point of the entire design. Because of our single-track system, the arched retractable canopy easily contoured to the shape of arched pergola beams, a rare luxury in the canopy business. Surely if the canopy can be curved, then fitting a pitched roof should be no problem. This homeowner envisioned a post and beam frame to cover his outdoor entertaining area. We can’t possibly mention a pitched roof without showing how awesome it looks on a commercial application. Since 1982, Earls Kitchen + Bar has evolved into North America’s distinguished destination for ‘upscale casual’ dining. Determined to make everyone “forget everything they knew about patios”, Earls King Street partnered with ShadeFX to bring style and versatility to their trendy outdoor space. Embodying the same keen eye for detail and excellence as Earl’s Kitchen + Bar, ShadeFX designed an outdoor canopy system that would cover sixty-percent of the patio with eight motorized canopies. This project was designed by Pogacnik Architects in New Canaan, Connecticut and is an impressive example of the ability of ShadeFX to cover irregular areas. The homeowner wanted both sun and rain protection for two pergolas that intersected at an angle. After extensive research into retractable awnings and canopies, the architect concluded ShadeFX was the only product capable of providing the solution needed. Now, at the first push of the remote-control button, both canopies extended smoothly, evenly, and effortlessly. Which one is your favorite? Comment below and let us know.